I was able to find and purchase a used Thompson Center (TC) Encore with a muzzleloader barrel (209 X 50) and a 7 mm Remington Magnum Barrel. 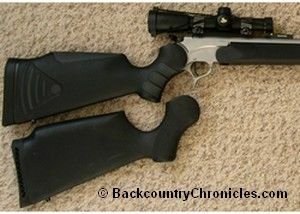 These were not new guns, but the Encore Pro Hunter interchange barrel system and the muzzleloader was new to me. For those not familiar with the TC Encore Pro Hunter system, all it takes to change barrels is to remove two screws from the forearm, pull out the hinge pin and switch out the barrels, replace the hinge pin, replace the forearm and attach the two screws. In addition to the 209X50 muzzleloader barrel, TC makes a barrel for almost every center fire, rim fire and shotgun you can think of and they are available as blue, Stainless Steel or Camo and they all fit on the same frame. When picking up the TC Encore the first time, You can tell there is a lot of metal here. It is a stout, well built, well machined gun. I immediately like the like the fit, the feel and the balance. The pistol grip stock fits my hand perfectly. The trigger is firm, but crisp, no play, no slop just firm, smooth and very little travel before the hammer snaps. My gun with scope, bipod and sling weighs 9.5 lbs according to the bathroom scale. Soon after I bought the guns, I bought a new Pro Hunter Flex Tech stock to replace the composite stock. It really helps manage the recoil. I can shoot the 7mm Rem Mag or 150 grain loads in the muzzleloader and not flinch. Stocks were also available in the Real Tree hardwood camo. I like the camo pattern, but chose the black composite stock because I didn’t think it was worth $50 more. The forearm is also available in the camo pattern for about $60. It was simple to change stocks; Remove the decal plate (two screws) on the stock, then loosen a nut and slide it off. Replace the new stock, tighten the nut and replace the decal plate. So now, I have a hybrid Encore/Pro Hunter. If you shoot a lot of 120 – 150 grain loads at the range, you will appreciate the 43% reduction in recoil. It helps save your shoulder and your scopes. I don’t shoot many 150 grain loads anymore, but I could shoot them all day with the new stock if I wanted. I added a 1x Nikon Buckmasters Scope (only 1x scopes are legal to hunt with muzzleloader in my state). I had to, I have become sufficiently experienced that my eyes will not adequately focus on the target, front and back sights at the same time. (Read post about shooting with corrective vision and muzzleloader scope). I also tried a “Red Dot” scope, but since I am red-green color blind, I could only see the dot on the snow. For me, the green dot option was not much better. Now that my state permits hunting with magnified scopes, I put a Simmons 3-9X/40 8-point scope on my muzzleloader. It’s plenty tough for a muzzleloader. While hunting, I fell in the creek and dunked and banged the scope. I tested it before hunting again the next morning, and it was right on. Can’t beat that for a $40 scope. Once I added the scope, it was obvious why the Thompson Center Pro Hunter now comes with an adjustable hammer. I can barely fit my thick thumb under the scope to pull back the hammer. I can do it, but it’s even harder to let the hammer down with any control. I bought the hammer expander at Amazon. It is a simple little thing to cost $12, but having a good grip on the hammer is also a safety issue. It simply slides over your hammer and tightens with an Allen wrench. The Carlson’s Hammer Expander extends in both directions instead of a single direction like a hammer spur. I have read that some people believe adding weight to the hammer causes misfires, but I have not had any misfires with the black powder or with the 7 mm Remington magnum center fire barrel. 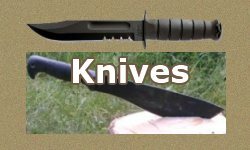 Originally, I tried using a hammer spur made by Rightnour, but it continued to come loose and I had to carry an Allen wrench with me in the field. I eventually lost it, so I do not recommend the Rightnour hammer spur. The first time I cleaned the gun at the range, I realized why the E-Z Tip primer extractor was needed. To remove the breech, I had to remove the fixed extractor. But first, I had to remove two screws on the forearm and a screw on the extractor. Then after cleaning, everything has to be re-assembled. This was a bad design, obviously not thought out. The E-Z Tip Extractor simply rotates out of the way when you want to remove the breech plug. I recently saw a guy at the range that still had the old style extractor. No wonder he waited so long between cleanings. If I had a spare, he would have paid $50 for it. Easier to clean = clean more often = better shot groups. Here are some additional gear that I picked up that makes my life easier when shooting at the range and when cleaning the muzzleloader. Shooting muzzleloader with bipod. Don’t forget to wear hearing protection. I picked up a 9-13 inch Caldwell bipod. It is easily attached to and removed from the front sling swivel stud by hand tightening. It makes an excellent bench rest at the range and always provides a good, safe place to rest the gun. I also have the 13-23 inch bipod I use when hunting. It also fits on the forearms of all the Thompson Center Centerfire barrels and I also use it on my 7mm Rem. mag barrel. The ram rod that comes with the Thompson Center Encore is acceptable for reloading a few shots in the field, but if you are going to be loading for dozens of shots and then cleaning between shots at the range, you will want a longer range rod, or you had better get a “hand saver”. I actually use two range rods when at the range, one for holding patches and one for holding the proper bullet starter, because it saves time not having to thread and un-thread jags and bullet starters. Cleaning Muzzleloader with Bore Snake. I was cleaning the barrel by running patches up and down the barrel, when a guy in the next shooting lane said “Try this” and pulled out a Hoppe’s BoreSnake and handed it too me. His 12 gauge sized snake was a little tight for the .50 barrel, but with a little help, we pulled it through the barrel a few times. Now this is the way to clean a barrel. I bought one (.50 caliber) for my self before I went home that night. I swear, it is the fastest, easiest way to clean a barrel and with the correct size, you can easily pull it through the barrel by yourself. Two passes, and the barrel is spotless. Best thing since sliced bread, all thumbs up. At first, I was not convinced that a groove cleaner was necessary, but bought one anyway; the Chiefs Pro Clean Retriever (#102). My logic is if the rifling is important, then it makes sense that the rifling be cleaned too. It is very simple to use, start by threading the groove cleaner onto your cleaning rod. Then drop it into the barrel and turn it slowly until the grove cleaner finds the grooves in your barrel. Gently push or pull the groove cleaner down the barrel. It is surprising how much “stuff” (burnt powder, plastic from sabots?) comes out of those grooves after the barrel has been cleaned and looks spotless. It must be doing something, so I use it for a good cleaning before putting the gun away. I clean the muzzleloader barrel using a BoreSnake (Hoope’s, .50 cal) with a little bore cleaner soaked into the first part of the BoreSnake, two passes, breech to mouth. Next, I lube the barrel with a lubed patch (two passes), then remove the excess with a dry patch (two passes). While I am cleaning the barrel, the breech plug is soaking in bore cleaner or dishwashing soap and water in an old film canister. Then I use an old toothbrush to clean the breech plug. I also use a DenTek Slim Brush to clean the hole in the plug (I also use these to floss my teeth). I dry the breech plug, make sure the hole is not blocked, then lube the threads and insert back into the breech. 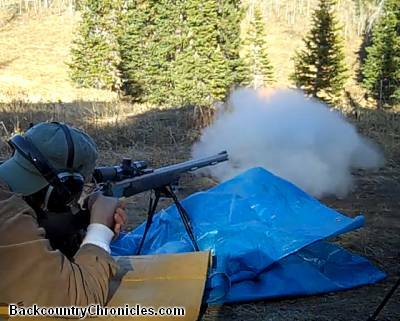 Randy Wakeman and others may be able to shoot 1 MOA groups “right out of the box” with the Thompson Center Encore Pro Hunter, but I was not able to shoot my Encore accurately at first. I started off using 150 grains of powder as recommended by the gun’s previous owner and some guys I met at the range the first day I shot it. Go big or go home right? It’s exhilarating to say the least, and I loved it, but I couldn’t keep the shots inside a 4 inch circle at 100 yards. I had read online about guys that claimed to shoot dozens of rounds before cleaning. So I figured that if I shot 8 or 10 times, then cleaned everything, I would be going the extra mile. I had intended to hunt with the Barnes TMZ bullet, but loading them was very hard in a dirty barrel. I actually had a bullet stick halfway down and was done shooting for the day. When I got home, I had to remove the breech, break up and remove the pellets and tap the bullet out. The “all knowing” guys at the range had suggested I get Power Belts because they were easy to load. Two days later I was back at the range to give them a try. Yes, they were easy to load, but the best I could shoot was still 4 inch groups. I was starting to question if it was my lack of ability or claims of 1 MOA accuracy for the TC Encore was a myth. I hunted with the muzzleloader that first fall using Power Belt (Copper Series Aerotips; 245 grain for mule deer, 295 grain for elk). I didn’t get a shot at a mule deer, but I missed a spike elk at 163 yards (no wind). He didn’t flinch, he didn’t even run until I almost finished reloading. Now I was questioning my ability and whether I would hunt the muzzleloader seasons the next year or not. Since I didn’t know any experienced muzzleloader shooters, all I had was forums and the internet. There is a lot of good information out there and also a lot of baloney. 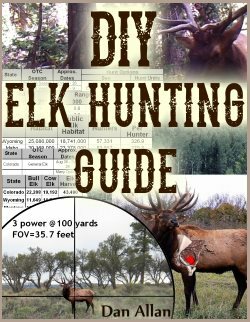 I was put on the right track at several web sites that questioned the need for 150 grains of powder for a deer when the old buffalo guns knocked down a two ton bison with 70 grains of powder. Several sites also stated the importance of cleaning after every shot for a consistent barrel, which leads to consistent shooting. Seems as if everything is important for shooting a muzzleloader accurately. Makes sense, since everything is important when reloading center fire ammunition and muzzleloading is reloading, every single shot. If you use the same bullet and sabot, the same powder or pellets and the same primer, then for the most part those things will stay the same. Though powder changes as it absorbs moister from the air, so old powder is not the same as new powder, it should be consistent while you are shooting your groups. There appears to be some variation in pellet weight and that only powder offers consistency for accurate shooting. Do you ever notice that some pellets are chipped? Also notice there is a difference when you measure powder if you bump the powder measure or not. The powder either needs to be measured settled or not settled to be consistent..
Bullets have to fit well, a bullet that is too easy to load will flop around too much in the barrel. Yes, Power Belt Bullets are easy to load, but now my remaining Power Belt bullets have become fishing sinkers. So if all the parts are the same, what changes? The barrel changes and the compression of the powder and bullet changes. A clean barrel may differ with the amount of lube and a dirty barrel will differ between 1st, 2nd … 10th shots. A warm barrel is different from a cold barrel and cleaning between shots helps to cool the barrel. 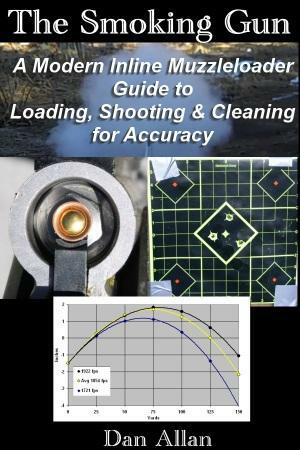 For accuracy, clean between shots and be consistent with the cleaning. I actually clean between every two shots. I use one target for clean bore 1st shots and another target for dirty bore 2nd shots. Also, try to imagine what your powder looks like if you jammed a bullet down a dirty barrel on top of the powder. How can that produce consistent results unless it is the exact same each time? We might as well practice those second shots too and it’s good practice to put a little pressure on yourself to reload quickly. In the field, any 2nd shot will be from a warm, dirty barrel. First shots are with powder, 2nd shots are with pellets. Not that pellet are that much faster than powder to pour from a speed loader into the barrel, but imagine trying to reload with powder while lying down. As soon as I started cleaning the barrel after every shot, and I switched from pellets to powder and reduced the amount of powder, accuracy improved. I can count on 2 inch groups (100 yards) with the Barnes TMZ bullets. My gun seems to shoot the best groups with 95 grains of powder for the 250 grain bullet and 100 grains of powder for the 290 grain bullet. Then I tried shooting the Barnes T-EZ bullet after reading Randy Wakeman’s Barnes Bullet review. The T-EZ is a made for tight-bore muzzleloaders like Thompson Center’s. The bullet is similar to the TMZ, but has a flat bottom instead of the semi-spitzer shaped TMZ. The ballistics coefficient is slightly lower than the TMZ, but the main difference is the thinner Sabot. I also bought thinner sabots to use with the TMZ bullets. The first trip back to the range with the new combination, I shot 2 inch groups (all 10 shots) at 100 yards with 120 grains Pyrodex powder and 250 grain T-EZ bullets and sabots with clean bore. I also shot 2 inch groups (9 shots) with 120 grains Pyrodex pellets with each 2nd shot with dirty barrel. If I include a shot where I know I flinched (guy beside me at the range bounced a .223 case off of me), the 10 shot group (2nd shot, dirty barrel) was 3 inches. The T-EZ is easier to load and especially when the barrel is dirty, but the bullets seat firmly. Note: Since I originally wrote this, I occasionally shoot 1 MOA groups using my 1x scope, which is good since the reticle covers more than 1 MOA of the target. At 100 yards, the 1x reticle covers a 2.88 MOA area on the target. On the few occasions that I have taken the time to switch to and zero my 3-9x scope, I can shoot 1 MOA groups. When I shot through a chronograph for the first time, I was surprised at the variation and the slow muzzle velocities (mv) I got using 120 grains of Pyrodex powder (1681 – 1892 fps – Barnes Bullets reports 120 grains of powder should average 1986 fps). Using 120 grains of Pyrodex pellets, mv ranged from 1721-1922 fps (Barnes reports 1925 avg. fps). This shows a major issue with accuracy of a muzzleloader is the lack of consistency from the powder, especially old powder, so make sure you use fresh powder or pellets when it counts. One inch accuracy at the range is one thing and actually hunting is another. I have shot enough rounds during realistic target practice that I know I can count on 2-3 MOA groups at a variety of distances and angles. If I don’t try to reach out too far or if it’s not too windy, 3 inch groups on a deer’s 5 inch kill zone will put meat in the freezer. I have a smooth bore thompson center 20 Ga.Can you shoot a 3in mag through my gun only rated “3in”…does it have to say 3in MAG? TC barrels are known for their strength, but if your gun was designed for Magnum shells, I think the barrel would say so. You can call Customer service at Thompson Center at 1-866-730-1614 and get the word straight from the source. Let us know what they say. What scope mounts did you use for your 1x scope? I have the same exact set up but when I look through the scope I can see my front sight. Do you have the same problem? I mounted the scope with the TC (Weaver style) base and with standard Weaver rings. Yes, I can see my front sight through the scope as well. I thought about taking the front sight off, but never have. Seeing the front sight does not bother me, in fact it is instructive. When my cheek is not perfectly “welded” to the stock, the front sight is not aligned with the cross hairs. The Nikon 1×20 scope (Nikoplex reticle, has a subtension for the widest distance between the thick parts of the cross hairs of 69.12 inches at 75 yards. Through my scope, I can see about 1.5 times this distance between the cross hairs and the top of the front sight. So I have “clearance” of over 100 inches at 75 yards and 138 inches at 100 yards. Even at close range such as 25 yards, the is about 46 inches of clearance (bull elk averages 59 inches at the shoulder). Every time I have lined up on an animal (to shoot or just look), the kill zone has always been clearly visible. You could try elevating the scope, but I would think that would move your eye and cheek too far up. My suggestion is to leave it as is and see if you can learn to ignore it or use it to verify you are aligned properly with the scope. If not, remove the front sight. 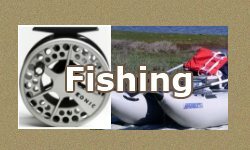 What is the differance between a Thompson Center pro hunter barrel and a endeavor barrel? The Endeavor Barrels are new and I haven’t seen one yet. Neither the Thomson Center Arms website nor the catalog provide much info. Probably why you are contacting me. To get more information, I first tried contacting TC Arms by email, but the email bounced back as undeliverable. Go figure. Big company like that doesn’t have a working email. Even the govt. seems to have working email. I also tried to call them on the phone. The automated system warned me the wait could be long. I waited on hold (listening to big band music) for about 20 minutes and gave up. TC makes great guns, but don’t seem to put much effort into maintaining their email or customer service. So, to attempt to answer your question, What is the difference between the pro hunter and the new endeavor muzzle loader barrels? The new Endeavor barrels are 28 inches long and are fluted and use the speed breach XT, but so do some of the Pro Hunter barrels. The Endeavor barrels are available in blue, Stainless or camo as are Pro hunter barrels. FYI, Encore Barrels are 24 inches long. The TC website says “…equipped with the revolutionary features of the Pro Hunter, the Endeavor goes further with its beautiful detail and added innovation. My next questions are: What detail? And what innovation? Without any details, just sounds like marketing to me. FYI – Thompson Center Customer Service ([email protected]) never answered my email. Still waiting… but no longer holding my breath. I agree with their CS is in need. I’ve got a Encore (300 Win Mag, 3006, 50 cal x209) and Black Diamond 50 cal 209. I had to order a replacement primer adapter for the Black Diamond. wait time 2-3 months (was after blackpowder season started) when it arrived it came with new bolt??? My load is 100 grn. or 2 50 grn pellets with 250 grn sabots. So which do you use more often, The Encore or the Black Diamond? What brand bullet/sabot do you use? What do I use on my pro hunter barrel and not damage the weather shield ? Good question. I can not find any information from Thompson Center (TC) about special care for the weather shield coating. Does that mean it doesn’t need any care? I read somewhere that if you nick the weather shield with a cleaning jag it will scrape off. Others claim it attracts and holds moisture. All my TC barrels are stainless, so I do not have personal experience with the weather shield coating. Assuming the above claims are true, I would wipe the outside of the gun with a soft cloth to remove dirt and moisture and then coat it with gun or machine oil. This would be a good question to ask TC directly, but in my experience, TC has never answered any of my questions. I have a FlexTech Pro Hunter weather shield 28″ in 7mm Mag. I seem to have a barrel that groups first two shots then a flyer? I was concerned about the forearm screws applying pressure to the bottom of the barrel? Is this third shot “flyer” something you see 90 – 100% of the time or more like 50% of the time? And by “flyer” are you talking an inch off or 6 inches off? Since you ask the question, it is obvious you recognize that many factors can affect where a bullet impacts. I believe you are talking about applying pressure as the barrel heats up. The forearm screws should be consistent as to how they hold into the barrel, but as the barrel heats up and expands, your hypothesis is that the top can expand more than the bottom because of the two forearm screws. And this is causing your third shot flyer. Do I have it right? Your hypothesis should be testable. 1. What happens on the 4th and 5th shots when the barrel is even warmer? 2. What happens if you remove the forearm? 3. Are the flyers off vertically or horizontally? My thinking on #3 is if the barrel is restricted on the bottom, would that be more likely to translate into horizontal flyers or low shots? I have an older TC 7mm barrel. I also get flyers, but never consistently when the barrel is cold or hot. In my case I assumed it is my fault (not being “warmed up” and totally focused on my shooting techniques). Let me know what you learn and maybe others will chime in with their ideas and observations. At first I changed scopes thinking the scope was at fault. Then with new Redfield Revenge 18x get the same flyers. Flyers are 3″ or more and off horizontally, with 4th and 5th shots also being erratic. Yes applied pressure to barrel, rather than complete float. I thought about creating a rest for my Lead Sled that supports the action rather than any upward pressure on forearm? Then take the forearm off and shoot? It seems like you have some strange voodoo messing with your rifle, so I am curious to see what you learn. I guess we will have to wait until Spring to find out if the forearm screws are the problem. After installing small orings on forearm screws I gently tightened. I also installed the TC adjustable hinge pin. Last I noticed the rear stock was a bit loose? I removed the pistol grip cap and tightened the cap screw. So much for all the diagnostic procedure to acquire accuracy? Glad you got it figured out, but do we know what the original problem was? Do you think it was the forearm or the hinge pin or both? I am curious to know if your gun will shoot accurately with the old hinge pin now. Making the alterations to my LEAD SLED went very easy!! The front rest is held in place with a single screw. So I took a piece of flatstock 1.5x 1/4 thick 7″ long. Drilled a 1/4 hole in each end. Remount the front rest to the rear. This will rest the TC Pro Hunter action, not the forearm. Can’t wait to shoot to prove or disprove theory? One triple seven magnum pellet with one triple seven regular 50 grain pellet on top (110 grains total) with 250 grain Shockwave sabots will shoot 3 holes touching at one hundred yards all day. I use triple seven primers and use one T17 saturated patch followed by a dry patch between shots. My t/c pro hunter is the best investment I’ve ever made. 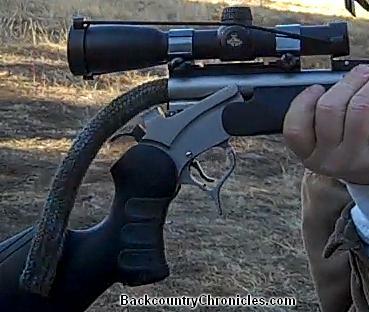 It will outperform nearly any muzzleloader out there! Thanks for the comment. Sounds like you have it dialed in. Do you shoot this well with open sites, or do you use a scope? 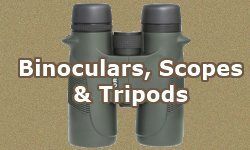 I have a 1X (non-magnifying) scope on my TC which (also wear glasses), but since the State made it legal to hunt with a magnifying scope on a muzzleloader, I am looking. I have never owned a scope that magnified more than 9x. Well I have never bought a muzzle loader. I’ve taken about 25 elk with archery here in Oregon. Been archery hunting since 1963. More so after Vietnam. They made us choose gun or bow a long time ago, before archery was so popular. My new adventure is long range accuracy. Started out with a four shot group 1.5″ at 107 yds., then screwed the forearm into place and fired the 5th shot. That shot hit down to the right. Down 3/4 R 1″ Center to center 3.25. So now we must solve this issue? I sent Thompson Center a message about my findings. TC responds by asking me to remove barrel pin. Then reinsert pin into barrel hole (should fit snug) then insert into action holes likewise. By barrel pin, you mean the hinge pin? And by action holes, do you mean the screw holes for the forearm? Is your hinge pin loose at all? I have a t/c pro hunter muzzleloader, I bought a 45/70 barrel and the forearm screws will not work on new barrel. Where do I buy correct screws? You should be able to find contact information at the Thompson Center Website (here). Been under the weather. My hinge pin is tight in the barrel holes but more loose in action holes. I wiil try the oversize pin. If I can find the source again? TC says they sell a adjustable pin. 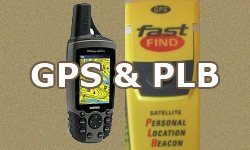 I will order the updated pin and get back to you, with results. Thanks Alan: I am very curious about the adjustable pin. As I said the barrel hole is tight around the pin but action holes are looser. So: how the pin actually functions is critical? Alan: If you will take a picture when they arrive, I will give you an address to email and I will post the pics. Pics will be better than 1,000 words. What’s the latest word on your TC? Last Winter, you were looking at oversized pins. This is a common problem with encores. Loose hinge pin bad head space. These guns have a lot of issues. They are junk. Big statement, short on facts and details. I’ll leave this up for a few days if you care to elaborate. I am perfectly happy with my junk. A statement made by someone that thinks everything just happens in a perfect way? I had a nice conversation (phone) with a Smith & Wesson rep. about these issues. They listened and were assured after I said: I’m not complaining I am trying to help make it better! They took notes and passed on to engineering. I stressed my point on finding a way to mount the forearm separate from the barrel threading. Thought I had my problems solved as on Monday my Thompson Center (TC) 7mm shot very good. Today the first shot was 4″ low and 2nd shot was 3″ low. It has done this for two years. I sent the gun to TC and they said nothing was wrong. Have the fore-arm screws as tight as I dare. Donnie: Since you have had this problem for two years, I am sure you have eliminated at all the obvious causes (like the scope). Since you sent the gun back and TC didn’t suggest changing the hinge pin, I don’t know what else to suggest. I am waiting to see if Alan (see comments), who was having a similar problem, has had any luck with an over-sized hinge pin. I have no such problem with my gun. In fact, I can change barrels and barely have to adjust the scope. This post is to advise the public about my experience with Thompson/Center’s & Smith and Wesson’s quality of products, process for handling quality issues, and customer service. I recently received a gun as a gift. The gun was not the one I wanted, so I took the credit for the gifted gun and applied it to a Thompson/Center Single Shot Pro-Hunter with a stainless steel Encore barrel in 30.06 and paid the difference. Furthermore, I have (3) Old School T/C Hawken muzzleloaders that were bought brand new in the late 80’s and have love them. After a few weeks, I received my gun from the gun dealer that was out of state via gun dealer in my state. I opened the box, examined it and found visible cracks in both welds where the barrel break is welded to the barrel. I immediately contacted the gun dealer with pictures and sent it back to them to have the barrel replaced and told them I would not accept a repaired barrel. They received my gun on 7/11/18. T/C received the gun on 7/18/18. On 8/7/18, I inquired to the gun dealer about the status of the barrel. On 8/8/18, he informed me that he just received notice from T/C that they have received the barrel, T/C had been shutdown for 2 weeks for yearly maintenance, and T/C gave no indication when the barrel would be replaced. On 8/15/18, I asked the gun dealer for an update and he had none. So I called T/C to speak with someone and after calling (3) times, being placed on hold initially for 43 minutes, 32 minutes, and 12 minutes respectively, and being told every time that they had no record until I got a specific reference number from the dealer, I finally spoke with someone who found my barrel in the system. According to the lady, they did have the barrel, they had been shutdown, but according to her no one was at the factory, only people answering the phone, and my gun would not be looked at by the head gunsmith until 8/29/18 to determine whether to repair the barrel or send a new one. Mind you I told the dealer, who had supposedly told T/C that I would not accept a repaired barrel. I paid full price for a new gun and therefore want a new barrel. So I asked the lady, the cracks are visible, this should have never been sent from the factory, I’ve paid my money, isn’t there another new barrel that could just be sent out? Her reply was no, we don’t expedite repairs, we follow first in-first out, and until the gunsmith looks at it on the scheduled date, there’s nothing that could be done. They wouldn’t even look for available stock until the gunsmith looked at my barrel. According to her, there was no one else I could speak with, there was no ‘let me talk to my supervisor and let’s see if we can help you out’. She didn’t even try to put me off by saying let me get your name and number and I’ll call you back. I had to ask her if she wanted my name and phone number!? I agree that not defective part should leave the factory and from your description, they are acting like the cable company. Everyone pretends to pride themselves on service and even wants to waste more of your time afterwards with a survey. I happen to like my TC, but if I had to put up with what you are, I could easily go a different direction. Too big to fail? (AKA too big to succeed). Let’s hope not. Backing off powder amounts then building up in muzzle loading is the best way to find accuracy in your smoke pole. With 45- 50-54 cal I would start with 60 grains and work up by two grains additional each load to find the barrel’s sweet spot. Clean after every shot. I use FFG black powder (my firearms prefer it over pyrodex or pyrodex substitutes) to get repeatable accuracy. Yes, thanks for the comment Jim. This is also covered in several posts about muzzleloader shooting accuracy. My gun shoots 290 grain bullet most accurately with 120 grains instead of 150. It shoots 240 grain bullet best with 110 grains. Instead of cleaning after each shot, I suggest using two targets, one for clean barrel and one for 2nd dirty barrel shot (just like a 2nd hunting shot), then clean the barrel. It is very instructive. Folks should also pay lots of attention to how their gun behaves with that 1st cold barrel shot because that is how you have to hunt.